As title says, im on an r2droid2. My battery is horrid (as most of you could have guessed ) So I was wondering if I should root my new phone. I am just EXTREMELY nervous of getting my bricking my brand new (and first) smartphone. Can somebody please explain what ROMs are too? Would that also mean I could use those gba emulators on the Market too? I have done quite a bit of snooping around this forum as well, but it was be more than appreciated if somebody could just give a real quick synapse of everything to do with all of this. What are all your opinions on this? Thank you all very much in advance! Well first off you can use those gba emulators in the market place with out rooting your device. The tiger ones are even free, you get the games by downloading the emulator ROMs app in the market. How bad is your battery life? If i were you i would wait until your initial 14 days are up. By rooting your phone you void your warranty (you can unroot and then your warranty will be fine) so if your wait and something goes wrong with the device or you decide you want a different one then you can easily return it with out having to unroot. Since the sbf (which is like the stock rom kind of) is out for the droid 2 you shouldnt need to worry about permanently bricking your device. Though i don't know if there is a separate, different one for the R2D2. I look at ROMs as the software of your phone. Right now you have the stock R2D2 ROM loaded on your phone, this has blur, which is motorola's "overlay" of stock android. Blur is bad for your battery and really slows down your phone. So you could download a stock vanilla android like ROM. This new ROM you get will replace your ROM you have right now. It will be different and you wont see junk apps or moto stuff. 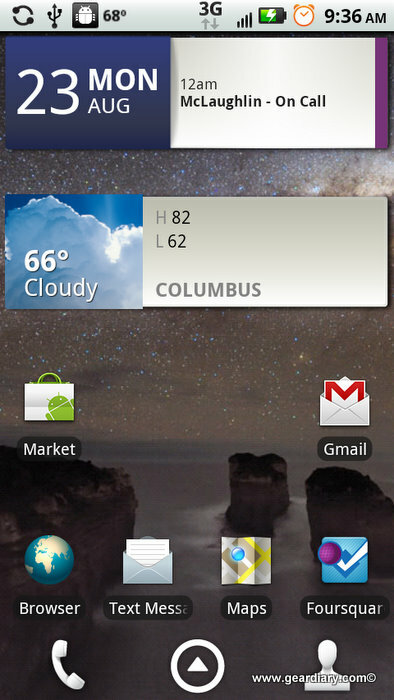 It may change the color of your status bar, you can apply different themes to the ROM. If there are many ROMS available for a device then you can constantly try new ones out, and it makes it feel as if you are getting a new device each time. Installing a ROM is pretty simple, once you root and get the bootstrap from the market. Before you flash (install) this new ROM you do a backup, so if anything goes wrong you can revert your phone back to the way you had it. I know i might of missed one or two things, and that was not intended to be a guide, you can find a good guides to root and install ROMS here or all over. P.S here is a fission ROM on the left vs. a regular, stock blur ROM on the right. Most of the customization to make the regular look like the one on the left can be had by downloading this gingerbread launcher.